I think this would cause more bad than good. It would be confusing and unnecessary. Players can just keep jumping and eventually get better with time, or maybe ask more experienced players for tips. WTF... non realistic hills? are u serious? That'd be quite entertaining but I am against because of some reasons. One of them is the fact that making unexistent hill doesn't cost necessarily less time than the real one. By the way I wouldn't feel that sense of motivtion and honour to jump on Norway HS138 whereas we've had to do with original hills in DSJ4. For me it doesn't matter. It would actually be fun to jump on a futuristic HS300 hill with DSJ4 physics. I wonder how it would be. Hi all, my first post here, but I'm addicted to this game for 2 years. Prepare refreshed version based on DSJ4 (what a great physics engine, I'm enjoying every jump in this game) with new hills, refreshed graphics (this simple style is really good and it shouldn't be changed to some photo-realistic one). What is the main issue for new players is the entry-level of this game. It's really hard at the beginning, people are trying demo for 1h and then uninstalling because they couldn't jump those 20m. There needs to be a tutorial or/and arcade mode with simpler physics. THE DSJ4 REALISTIC PHYSICS MUST STAY THOUGH (there are many DSJ clones on the market, but no one is having such feel of the air) and player should be accustomed to it while they progress. When you get to that you all know what happens - you get to that flow, you need to beat your own records, beat other people online etc. It reminds me arcade games - simple, addictive games with only one objective - get better score. People do remember this game and I think if it will be made right - then people will know about DSJ5/DSJ4.5. + Piracy nowadays isn't such a problem in Poland like it was during DSJ2 era. Buuuut ofc it could be that Jussi isn't one man army, so maybe it's really time to go with that game and show to some publishers? They'll handle marketing right, they'll publish it in right places etc. but still - to do that there is a need to show complete product, so still a risk with resources. If not - why not to try with publishing on steam? It is still a good way to get some new players. I think that buying game from your website is obsolete method, people are seeing price only in one currency, website is looking bad etc. If I had to choose between buying this game here vs steam - I would go with steam. it's impossible especially while there is only one nation playing this game cheers. It's hard to be a nissemann! This is dreams, but what Jussi think for tutorial for the game? A lot of new players have a problem with jump. 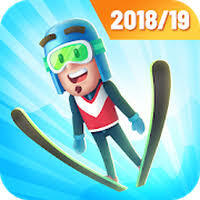 Best ski jumping game of 2018!